Pati Jinich is host of the popular James Beard Award winning and Emmy nominated PBS series Pati's Mexican Table, author of two cookbooks, and resident chef at the Mexican Cultural Institute in Washington, DC. This is her official website where she shares recipes from her show and new recipes in her blog, plus upcoming events, recent news, and more. Place the beans in a big heavy pot and cover with enough water to cover the beans by at least 3-inches, about 12 cups of water. Incorporate the onion and bring to a rolling boil. You may also add cilantro or epazote. Let the beans simmer over medium heat, partially covered, for about 1 hour and 15 minutes, until the beans are soft and then add the salt. Don’t add the salt in the beginning, or it will toughen the beans. Let them continue simmering for another couple minutes, or until the beans are so soft, they come apart if you hold one between your fingers, and the broth has thickened to a soupy consistency. If the beans are not yet soft and the broth is drying out, add more hot water. Remove the cooked onion and herbs with a slotted spoon before serving. Pati's Mexican Table TV series is produced by FRANK. and WETA Washington, DC, and distributed by American Public Television (APT) to public broadcasting stations nationwide. Corporate funding is provided by MTB, Avocados from Mexico, La Costeña, FUD USA, Coronado USA, and Visit Tucson. I watched this episode and see that a clay pot was used, are there any benefits to cooking in clay pots, and it is placed right on the fire? The clay pots have interested me since seeing them used in Cancun, my local Mexican market have them and I been thinking about giving it a try. I also like the aesthetics and nostalgia of them. Oh the clay pot imparts an earthy, deep flavor. Give it a try, Vince! Pati – I finally found some dried epazote at the Mexican food store in our town so for dinner tonight, I’m making your black beans, Rodrigo style sea bass, arroz verde, and a green salad with mango/habanero/avacado dressing. For a condiment to the fish and rice, I’m going to serve Julio’s salsa recipe (tomatoes, tomatillos, mixed dried chilis, etc.) from your second cookbook which I made yesterday. YUM!!! Question: Can I use Julio’s salsa as a marinade for fish or meat? Maybe by adding lime and orange juice to it? Or would it be best to use it as a condiment? I love the rich flavor. Hm. I have not used his salsa as a marinade. But… there is no reason why it couldn’t work… if you do, let me know how it turned out!! My wife left me and my son to fend for ourselves so I have to be like Mr Mom (the movie). Your recipes have helped me to prepare Mexican food like his mom makes it. Thank you and God bless you. By the way, you have a beautiful family. Oh have fun being Mr. Mom, Gilberto! I’m inclined to follow your directions Pati. First of all, you have cooked many more beans than I have. Secondly, I’ve read many recipes that say to salt toward the end. Thank you for sharing all of your wonderful recipes. Thank you for helping us gringos to cook wonderful Mexican dishes. Pati..can you use dried cilantro or epazote..or do you use fresh? Dear PattiI would like to cook a nice,tasty Valentine’s dinner for my boyfriend, Reinaldo I was thinking some shrimp and steak what do recommend and for desert which flan do you recommend? He doesn’t know so he’s a big eater I need your help with a shrimp recipe that would go well with pasta I’m big on pasta please help me plan something nice. Thank you soon much. Patti, do you ever soak the beans for a few hours or overnight? I want to make some beans but I do not have black beans, only pintos. Will the recipe work using beans besides black? I love your book! Sure! Mmmm pinto beans are my FAVORITE! I just got and used epazote today to cook beans, I love the flavor the it gives the beans, what else can I use it for? I noticed someone asked about using dried, I could do that. So many things! To flavor soups, rice dishes and stews. You can also add a leaf inside of a quesadilla! Would dried epazote work in this recipe? Hola, Pati. I am going to try epazote leaves in my pot of black beans this week, but I am a little reluctant because of descriptions of its “stinky sweat” flavor/aroma description I’ve read online. Should I use just a small amount, then, to start? 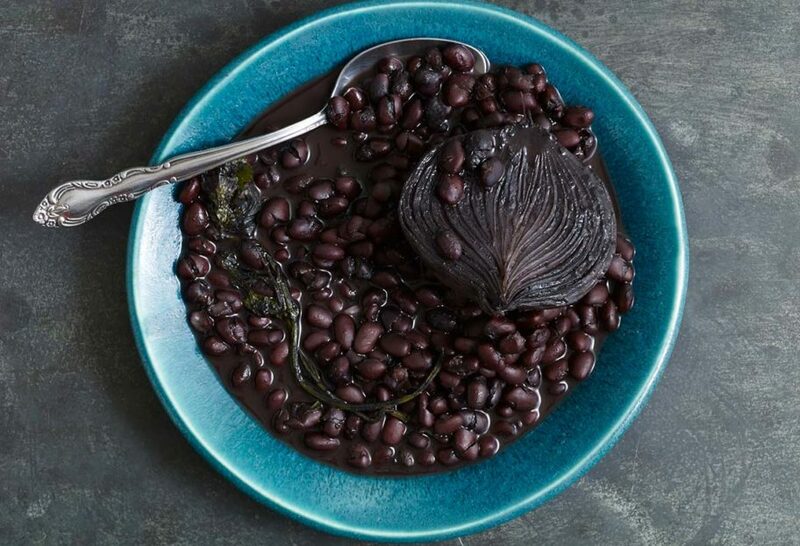 Would you ever make black beans without it? I am not a fan of cilantro, even, except on authentic tacos with diced onion, etc., so I’m not sure how to go. Thanks! You can always leave out the epazote no problem, Keith! And start with a small amount and see how you like it. Thank you, Amber! I hope you like everything you try from my show and site. Thanks for sharing it. Delicious. I love the TV show! Please convey the message to Patti! I’m sure her boys love her cooking. We love you so much, Pati! You, your husband, and your three wonderful boys! © 2010-2019 Mexican Table LLC.